Learn this and more in video 1 of the chair conformation series. Learn how to recognize a chair, what it represents (with a model kit and on paper) and the nature of axial and equatorial substituents. 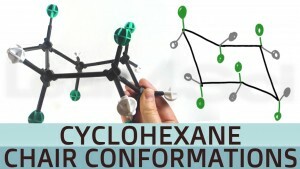 This is video 1 in the Chair Conformations Tutorial Series. I’ve NEVER understood chair conformations until I watched this video. Now it makes a lot more sense! thank you so much! Wonderful to hear, Nathan!! You’re welcome!